Having outdoor spaces on your property is a distinct benefit; but you would be able to use these areas optimally only when they are designed and planned well. Landscaping is much more than just installing a few plants and trees. It’s a lot about ensuring that these spaces have different elements and features in the right proportion. This is where a landscape designing company comes into the picture. We at Mother Nature Landscaping are a full service company that has handled a number of small and large scale landscape design projects for customers in and around Bloomington, Martinsville, Mooresville, Bedford and Columbus. Over the years we have also catered to customers across Franklin, Seymour, Greencastle, Greenwood, Plainfield as well as Beech Grove. Just as we focus on using high-grade materials and workmanship, we also ensure that all the features are low maintenance. This reduces the overall expense of the landscape in the long term. We know what it takes to provide our customers with solutions that they will be 100% satisfied with. 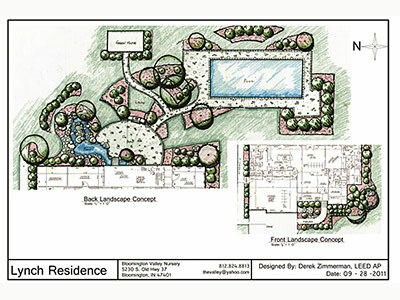 If you are looking for experienced and reliable landscape designers, we are the company to call. You can discuss your project details with the specialists at Mother Nature Landscaping and we will provide solutions at very reasonable landscape design cost. The number to call is - 812-339-5296. You can also contact us via this online form or request for a free consultation and quote via this form.